(Nanowerk News) A new analysis of by-products discharged to the environment during production of carbon nanotubes (CNTs) — expected to become the basis of multibillion-dollar industries in the 21st Century — has identified cancer-causing compounds, air pollutants, and other substances of concern, researchers reported here today at the 234th national meeting of the American Chemical Society. Study co-author Desirée L. Plata and colleagues described their work as “totally new,” noting that past analyses of the environmental impact of the emerging nanomaterials industry have been based on the toxicity of ingredients used in the recipes, rather than the actual pollutants formed during CNT manufacture. While expressing concern about the possible health and environmental effects of nanotechnology by-products, Plata said the new data may be crucial as the nanotechnology industry seeks to avoid the kind of unanticipated health and environmental problems that have accompanied emergence of other new technology. Toxic by-products of carbon nanotube manufacturing. 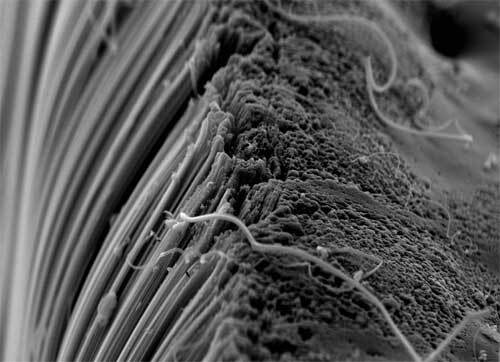 These spaghetti-like structures are carbon nanotubes viewed under an electron microscope. The manufacture of these nanotubes can produce toxic byproducts, researchers report. Researchers said, for instance, that they foresee developing, in collaboration with the CNT industry, “green chemical” reactions and filtration systems to substitute for those with potentially hazardous by-products and other ways of manufacturing carbon nanotubes that minimize potentially adverse impacts. Recent experiences with other industrial pollutants underscore the need to try to improve nanotube manufacturing methods before serious problems arise, said Plata. These pollutants include Freon refrigerants, the gasoline additive methyl t-butyl ether (MTBE), flame retardants like polybrominated diphenyl ethers (PBDEs), and the surfactant perfluoroctane sulfanate (PFOS), she noted. Her collaborators include graduate advisor Christopher M. Reddy, Ph.D., of the Woods Hole Oceanographic Institution in Woods Hole, Mass. and Philip M. Gschwend, Ph.D., of MIT. Carbon nanotubes, submicroscopic cylinders of carbon that are thousands of times smaller in diameter than the width a single human hair, possess characteristics not found in their larger, bulk counterparts, including enhanced strength and high electrical conductivity. Studies by other scientists have shown that carbon nanotubes, which come in many sizes and shapes, can damage the lungs of mice, but their exact risk to human health remains unknown. Even less is known about the potential effects of the by-products of nanotube production, the researchers said. To evaluate the emission products formed during nanotube production, Plata and her associates utilized a small-scale device to simulate “chemical vapor deposition,” one of the main methods for making CNTs. Using a carbon vapor source, the researchers produced CNTs and analyzed chemical by-products from the reaction. They found at least 15 aromatic hydrocarbons, including four different kinds of toxic polycyclic aromatic hydrocarbons (PAHs) similar to those found in cigarette smoke and automobile tailpipe emissions. The most harmful PAH identified was benzo[a]pyrene, a known human carcinogen, the researchers said. They also saw release of other hydrocarbons that can contribute to smog formation and can trigger the formation of ozone in the lower atmosphere, which can in turn cause respiratory problems in humans, Plata said. “If nanotubes are produced in the tons, there will also be tons of PAHs produced,” Plata notes. She said that the key solution to the problem may also be to employ special filters or ‘scrubbers’ in the production process to reduce the formation of harmful by-products. Another possible solution is to develop new nanotube manufacturing processes that produce fewer toxins, said Plata, who notes that the research team is currently working with four of the major nanotube producers in the United States to help develop strategies to make production more environmentally friendly. CNTs are already produced on a small industrial scale, and the researchers plan to measure actual emissions at several industrial sites in the near future to get a clearer picture of real-world pollutant emissions. Funding for the study was provided by the National Science Foundation, the Woods Hole Oceanographic Institution, and the Center for Environmentally Benign Semiconductor Manufacturing.